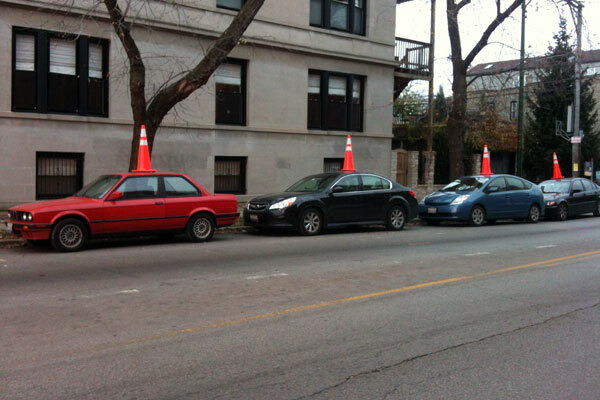 On my way out to run errands, I happened to see a line of cars – each of them sporting a traffic cone hat. This was early on a Saturday morning, and it made me break out into a huge grin. The cones made these cars look like they were in a parade, on their way to some kind of birthday party. I think that there was a truck from Peoples Gas in the area a few days ago, and they had left a few of these cones along the sidewalk. My best guess is that someone, walking home from the bars late on Friday night, decided to have a little fun. Whoever you are, mysterious prankster – you made me smile. And for that, I am tipping my hat to you. My large, orange and white party hat.